We propose a standardized protocol to characterize the cellular composition of late-stage murine atherosclerotic lesions including systematic methods of animal dissection, tissue embedding, sectioning, staining, and analysis of brachiocephalic arteries from atheroprone smooth muscle cell lineage tracing mice. Mahan, S., Liu, M., Baylis, R. A., Gomez, D. Quantitative Analysis of Cellular Composition in Advanced Atherosclerotic Lesions of Smooth Muscle Cell Lineage-Tracing Mice. J. Vis. Exp. (144), e59139, doi:10.3791/59139 (2019). Atherosclerosis remains the leading cause of death worldwide and, despite countless preclinical studies describing promising therapeutic targets, novel interventions have remained elusive. This is likely due, in part, to a reliance on preclinical prevention models investigating the effects of genetic manipulations or pharmacological treatments on atherosclerosis development rather than the established disease. Also, results of these studies are often confounding because of the use of superficial lesion analyses and a lack of characterization of lesion cell populations. To help overcome these translational hurdles, we propose an increased reliance on intervention models that employ investigation of changes in cellular composition at a single cell level by immunofluorescent staining and confocal microscopy. To this end, we describe a protocol for testing a putative therapeutic agent in a murine intervention model including a systematic approach for animal dissection, embedding, sectioning, staining, and quantification of brachiocephalic artery lesions. In addition, due to the phenotypic diversity of cells within late-stage atherosclerotic lesions, we describe the importance of using cell-specific, inducible lineage tracing mouse systems and how this can be leveraged for unbiased characterization of atherosclerotic lesion cell populations. Together, these strategies may assist vascular biologists to more accurately model therapeutic interventions and analyze atherosclerotic disease and will hopefully translate into a higher rate of success in clinical trials. Atherosclerosis is the leading cause of morbidity and mortality worldwide underlying the majority of coronary artery disease, peripheral artery diseases, and stroke. Late-stage coronary atherosclerosis can lead to severe complications including myocardial infraction accounting for nearly 16% of world population mortality1,2. Due to its devastating impact on public health, substantial effort has been made to decipher the mechanisms driving atherosclerosis progression, as well as to develop novel therapeutic strategies. Yet, the Likelihood of Approval (LOA) rate of clinical trials for cardiovascular disease is among the lowest when compared with other clinical fields (only 8.7% for phase I)3. This can be explained in part by many barriers that atherosclerosis poses to efficient drug development including its nearly ubiquitous nature, clinically-silent progression, and significant disease heterogeneity. Moreover, the suboptimal design of preclinical animal studies can also be accounted for the lack of success in clinical translation. Specifically, we believe it is necessary to implement intervention studies whenever possible to investigate the efficacy of therapeutic strategies. Also, there is a critical need to perform standardized procedures for lesion analyses including advanced characterization of late-stage atherosclerotic lesion cellular composition by fate mapping and phenotyping. The vast majority of atherosclerosis studies focus on models of atherosclerosis prevention consisting of drug treatment or gene manipulation (knockout or knock-in) in healthy young mice, prior to the disease initiation and progression. These studies have uncovered a large number of genes and signaling molecules that play a role in atherosclerosis development. However, most of these targets failed to translate to efficient therapies in human. Indeed, it is difficult to extrapolate the effect a therapy has on healthy young mice to elderly patients with advanced atherosclerotic lesions. As such, the implementation of intervention studies in the preclinical experimental pipeline likely provides a more accurate depiction of the relevance and efficacy of a new therapeutic. The idea is supported by the strikingly divergent effects of inhibiting the pro-inflammatory cytokine Interleukin-1β (IL-1β) when employing a prevention4,5,6 or intervention strategy7. Differences between prevention and intervention studies suggest that different cellular processes occur at different phases of atherosclerosis development and highlights the fact that prevention studies are likely insufficient to model the clinical scenario adequately. The American Heart Association recently published a scientific statement detailing recommendations for proper experimental design, procedural standardization, analysis, and reporting of animal atherosclerosis studies8. It highlights the benefits and limitations of predominant techniques used in the field. For example, en face Sudan IV staining of the aorta is often performed as a first read-out. Although en face Sudan IV staining of lipid deposition is a suitable method for assessment of global plaque burden, it is unable to distinguish early-stage fatty streak lesions from more advanced late-stage lesions. As such, the interpretation of en face staining is often ambiguous and superficial9. Careful analysis of tissue cross sections using the morphologic parameters vessel, lesion, and lumen size and quantification of indices of lesion stability provides a more accurate understanding of the effect of an experiment. Finally, human histopathology studies have suggested that cellular composition is a better predictor of rupture than the lesion size itself, with lesions poor in smooth muscle cells (SMC) and rich in macrophages being more susceptible to rupture10,11. These observations were based on staining for markers classically used for cell identification (i.e., ACTA2 for SMC and LGALS3 or CD68 for macrophages). However, the expression of these markers is not strictly restricted to a single cell type in atherosclerotic lesions due to the plasticity of multiple lineages including SMC, endothelial cells and myeloid cells12. In particular, the unambiguous identification of SMC within atherosclerotic lesion was virtually impossible until the past decade because of the property of these cells to dedifferentiate and repress their lineage-specific marker genes (a process referred as phenotypic switching) in injured or diseased vessels13. This limitation in SMC identification has been circumvented by the development of lineage tracing7,14,15,16,17,18,19,20,21,22,23,24. It consists of permanently labelling SMC and their progeny to track their fate and phenotypic evolution during atherosclerosis progression by using a combination of the expression of Cre recombinase driven by SMC-specific promoters (i.e., Myh117,15,17,18,19,20,21,22,23,24, Acta225,26 and, SM22α14,16) and the activation of reporters (e.g., fluorescent proteins, β-galactosidase) [reviewed in Bentzon and Majesky 201827]. In one of the first studies employing SMC lineage tracing outside of embryogenesis setting, Speer et al.14 provided evidence that SMC can modulate their phenotype and transdifferentiate into chondrogenic cells during vascular calcification by using an SM22α Cre R26R LacZ lineage tracing model. Although these studies pioneered SMC lineage tracing, they were partially equivocal in that any given non-SMC expressing SM22α in the setting of the disease would be labeled by the reporter. This limitation has been bypassed by the development and use of tamoxifen-inducible Cre ERT/LoxP permitting a temporal control of cell labeling. Cell labeling occurs exclusively during tamoxifen delivery and will be restricted to the cell expressing the cell type-specific promoter driving Cre ERT expression at the time of tamoxifen exposure, avoiding tracing of alternative cell types activating Cre in the setting of disease progression. For lineage tracing of SMC in atherosclerosis, the tamoxifen-inducible Myh11-Cre/ERT2 transgene associated with fluorescent reporters (eYFP7,15,17,18,21, mTmG19,25, Confetti20,22,23 for clonal expansion studies) has demonstrated a remarkable efficiency and specificity in SMC labeling and has been used to fate map SMC populations in atherosclerotic lesions in recent studies. Importantly, these studies revealed that: 1) 80% of SMC within advanced atherosclerotic lesions do not express any conventional SMC markers (ACTA2, MYH11) used in immunohistological analysis and therefore would have been misidentified without lineage tracing17; 2) subsets of SMC express markers of alternate cell types including macrophage markers or mesenchymal stem cell markers16,17,19; and 3) SMC invest and populate the atherosclerotic lesion by oligoclonal expansion and SMC clones retain plasticity to transition to phenotypically different populations20,23. To summarize, it is now clear that smooth muscle cells present a remarkable phenotypic diversity in atherosclerotic lesions and can have beneficial or detrimental roles on lesion pathogenesis depending on the nature of their phenotypic transitions. These discoveries represent a remarkable new therapeutic avenue for targeting SMC athero-promoting phenotypic transitions in late-stage atherosclerosis. Herein, we propose a standardized protocol for analyzing late-stage murine atherosclerotic lesions including systematic methods for animal dissection, embedding, sectioning, staining, and quantification of brachiocephalic artery lesions. 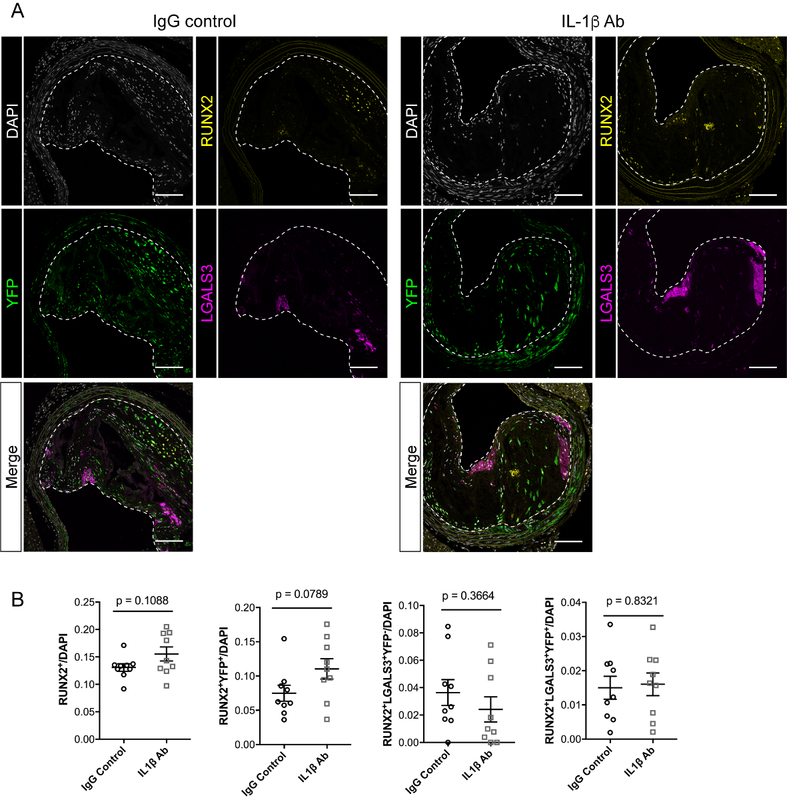 To determine the effect of Interleukin-1β inhibition on SMC fate and phenotype, we used SMC lineage tracing ApoE-/- mice fed a western diet for 18 weeks before receiving weekly injections of an anti-IL1β antibody or isotype-matched IgG control. Animal breeding, handling and procedures were approved by the University of Virginia and the University of Pittsburgh Institutional Animal Care and Use Committee. Breed Myh11-Cre/ERT2 males28 (Jackson Laboratory; #019079) with R26R-EYFP females (Jackson Laboratory; #006148) to obtain Myh11-Cre/ERT2+ R26R-EYFP+/+ males. Breed the Myh11-Cre/ERT2+ R26R-EYFP+/+ males with ApoE-/- female mice (Jackson laboratory; #002052). Cross the progeny and select by genotyping Myh11-Cre/ERT2+ R26R-EYFP+/+ ApoE-/- male and R26R-EYFP+/+ ApoE-/- female mice as final breeders. Clip tails and perform genotyping on littermates. All male mice should be Myh11-Cre/ERT2+ R26R-EYFP+/+ ApoE-/- and can be used as experimental mice (Figure 1A). NOTE: Genotyping protocols can be found on the Jackson Laboratory website. The Myh11 Cre/ERT2 transgene is located on the Y chromosome, precluding the use of females. Other lineage tracing systems can be used, but this system is to date the most reliable lineage tracing strategy to fate map SMC in atherosclerosis. Have male Myh11-Cre/ERT2+ R26R-EYFP+/+ ApoE-/- mice receive a series of 1 mg tamoxifen injections from six to eight weeks of age to label permanently Myh11+ SMC with YFP and to track their fate (Figure 1A). Heat peanut oil at 55 °C. Add tamoxifen in pre-heated peanut oil to prepare a solution at 10 mg/mL and incubate at 55 °C until complete dissolution of tamoxifen. Perform an intraperitoneal injection with 0.1 mL of 10 mg/mL tamoxifen solution for a series of ten injections over two weeks. NOTE: Tamoxifen is a biohazard and must be handled with care. Five to seven days after the last injection with tamoxifen, replace chow diet with high-fat diet (e.g., western diet; 42% kcal from fat; 0.2% total cholesterol) for a duration of 18 weeks to allow for the development of advanced atherosclerotic lesions, which consistently develops in multiple vascular beds including the aortic arch, aortic root, brachiocephalic artery and the abdominal aorta. At 18 weeks of high-fat diet feeding, begin therapeutic intervention for the desired duration (Figure 1B). NOTE: As an example, we performed weekly intraperitoneal injections with an anti-IL1β antibody or an isotype-matched IgG control between 18 and 26 weeks of high fat diet. Remove food to fast mice for 8 to 16 h prior to tissue harvesting to perform accurate readings for plasma cholesterol and triglyceride. Animal euthanasia should follow Animal Care and Use Committee (ACUC) requirements and regulations. Euthanize the experimental mice by CO2 asphyxiation for approximatively 5 minutes and verify death by toe pinch. Weigh the mouse and collect blood. Perform cardiac puncture by inserting a 25G needle connected to a 1 mL syringe in the ventricle from the left side of the chest cavity. 0.1 to 1 mL of blood can be collected. Transfer the blood to an EDTA vacuum tube by flushing the syringe and place the tube on a rocker or rotator for 10-15 min. Transfer blood to a 1.5 mL tube and centrifuge for 10 minutes 250 x g at 4 °C. Carefully withdraw the top plasma phase with a pipette and adequate tips, and transfer to a new tube. Store at -20 °C prior to measuring cholesterol and triglycerides. NOTE: Whole blood can be used for additional studies including blood cell counts and other blood components including cytokines or immune cell profiling. Make an incision of approximatively 2 cm in the skin at the mid-abdomen using scissors and pull the skin to expose the abdominal cavity. Cut the peritoneum up to the sternum without damaging tissues. Make two cuts at the mid-axillary line through the thorax, being careful not to damage the heart and lungs. Lift the sternum with tweezers and cut the diaphragm to partially expose the heart. If the heart is not easily accessible, cut away the ribcage enough to reach the right atrium. Perfuse the mouse with a gravity perfusion system (Figure 2A). Install the gravity perfusion system such that the pressure of the perfusion fluid is equivalent to the average murine blood pressure (Figure 2B). This system allows for consistency in perfusion and both maintains the vessel morphology and flushes red blood cells. NOTE: As reference, C57Bl6 mice have a physiologic blood pressure between 120 mmHg (average systolic blood pressure) and 70 mmHg (average diastolic blood pressure)29,30. Average systolic and diastolic blood pressure can vary with mouse genetic background. Connect a 23 or 25G butterfly needle to the gravity perfusion system and run Phosphate-buffered Saline (PBS) through the needle to expel the air from the tubes. Insert the needle into the left ventricle and secure the needle in place. Using iris scissors, make a small incision (< 2 mm) into the right atrium or the ascending aorta. Perfuse with 5 mL of PBS, then 10 mL of 4% Paraformaldehyde (PFA) solution, then 5 mL of PBS. Use both PBS and 4% PFA solution at ambient temperature. Collect the tissues of interest (e.g., liver, lung, spleen) and place them in the 4% PFA solution. Clean the neck area by removing the skin and salivary glands. Perform one cut down the midline of the sternum through the manubrium using scissors. Be careful that the scissors stay close to the back of the sternum to avoid damaging the vasculature located closely below the sternum. Pull both sides of the ribcage with forceps to fully open the chest cavity. Carotids should be partially visible. Clean up by pulling muscles and connective tissue and removing fat with fine tweezers until the right carotid, the brachiocephalic artery the subclavian bifurcation and the aortic arch are cleaned and isolated of surrounding connective tissue and fat (Figure 2C). Using forceps, grab the right carotid below its bifurcation and make an initial cut above the forceps (Figure 2D). Still holding the carotid, make a second cut through the subclavian artery. The final two cuts are through the aortic arch, on either side of the brachiocephalic artery (Figure 2D). Collect other vascular tissues of interest (e.g., abdominal aorta, superior part of the heart containing the aortic root). Place the BCA and other tissues in 4% PFA solution overnight at room temperature. NOTE: The fixation time should be kept consistent throughout the study. Remove the tissue from 4% PFA and place in a labeled tissue cassette (Figure 3A). Use foam pads in the cassette to ensure the tissue retain its orientation and remains in the cassette through the processing step (Figure 3B). Close the cassettes and immerse in 70% ethanol until tissue processing (24 to 72h). Process BCA and other tissues collected for histological and immunofluorescent staining as follows (example of routine overnight procedure using a processor with vacuum penetration): 10% neutral buffered formalin for 30 min at ambient temperature (2x), 75% ethanol for 60 min at 30 °C (1x), 90% ethanol for 60 min at 30 °C (1x), 95% ethanol for 60 min at 30 °C (1x), 100% ethanol for 60 min at 30 °C (3x), xylene for 60 min at 30 °C (3x), and paraffin wax for 80 min at 62 °C (3x). Embed BCA vertically, with the aortic arch closest to the block face (Figure 3C). Cut through the paraffin block on a rotary microtome (10 µm thickness) until reaching the embedded tissue. Once the tissue is visible, examine a section under a microscope to determine position. If the aortic arch is still visible, remove up to ten 10 µm sections at a time, examining a section at each interval. When the aortic arch has been sectioned through and the brachiocephalic artery is visible, adjust the orientation of the block to position the tissue completely perpendicular to the microtome blade. Cut the BCA at a section thickness of 10 µm. At that point, all sections are collected serially with three sections per slide. Collect until reaching the subclavian bifurcation (Figure 3D). NOTE: It is important to cut the BCA at a section thickness of 10 µm for subsequent z-stack confocal image acquisition and single cell counting. This thickness will allow the rigorous and non-cofounding assessment of the association between a single nucleus and cytoplasmic or membrane staining though the depth of the cross section. NOTE: A complete characterization of atherosclerotic lesions includes assessment of morphological parameters and indices of plaque stability or instability and cellular composition that will not be the focus of the present protocol. Lesion morphology, collagen content, and intraplaque hemorrhage can be analyzed by Movat7,17, PicroSirius Red 7,31, Ter119 staining 7,18, respectively. Here, we will describe the protocol for analyzing the cellular composition of lesions. Incubate the slides in the following solutions at room temperature under a chemical hood: xylene for 5 min (2x), 100% ethanol for 5 min (2x), 95% ethanol for 5 min (2x), 70% ethanol for 5 min (2x), and deionized H2O (diH2O) for 5 min (2x). Incubate slides in antigen retrieval solution according to manufacturer's instruction. With citric acid based antigen unmasking solution (see Table of Materials), dilute 3 mL of solution in 320 mL of diH2O. Place the slides in a staining reservoir and fill to the top with the prepared antigen retrieval solution. Fill any empty slots in the slide rack with blank slides to ensure even heating. Cover the container with a lid to allow the antigen retrieval solution to boil without evaporation. Heat the slides in a microwave for 20 min at approximately 675-700 watts. Check the slides regularly and replace evaporated liquid with diH2O such that sections remain submerged in unmasking solution at all times. Allow slides to cool down in solution for 1 h at room temperature. Dissolve 6 g of Fish Skin Gelatin (FSG) in 1 L of PBS. PBS/FSG is used as washing buffer. Prepare a blocking solution of 10% normal serum in PBS/FSG. NOTE: Fish Skin Gelatin is used in the preparation of the blocking buffer. FSG does not contain serum proteins that can cross-react with mammalian antibodies, minimizing background noise. However, other blocking option should be preferred with biotin detection systems as FSG contains endogenous biotin. The type of normal serum used is based on the secondary antibody used. When donkey secondary antibodies are used, normal horse serum should be selected for blocking and antibody dilutions. Incubate slides in PBS for 5 min at room temperature. Circle tissue sections with a hydrophobic pen. Cover the sections with the blocking buffer PBS/FSG/normal serum for 1 h at room temperature. Prepare the primary antibody solution in PBS/FSG/normal serum during this step while the tissues are blocking. Incubate with primary antibodies diluted in PBS/FSG/normal serum overnight at 4 °C in a humidity chamber. One section per slide should be incubated with a mix of IgG control antibodies at the same concentration as the primary antibodies to control for primary antibody specificity. Wash the slides as follows at room temperature: PBS/FSG for 5 min (3x), then PBS for 5 min (1x). Incubate with fluorophore-conjugated secondary antibodies (see Table of Materials) and diamidino-2-phenylindole (DAPI) for nucleus counterstaining diluted in PBS/FSG/normal serum for 1 h at room temperature. Protect slides from light. Wash slides as described in step 5.6. Mount slides using mounting media suitable for fluorescence (see Table of Materials). NOTE: The use of a confocal microscope and z-stack acquisition is critical for single-cell counting. Set acquisition parameters to be used throughout the study: image resolution (1024x1024 or 2048x2048 pixels); Optical path and number of channels, which are a function of the combination of secondary antibodies selected; scanning speed (recommended scanning speed: 7-8); and differential interference contrast (DIC) channel. Using sections stained with the primary antibodies and IgG control, set the detector sensitivity, laser power, and offset for each individual channel. The IgG control is used to minimize the background signal. Set up the upper and lower positions for z-stack acquisition. Predetermine the thickness and number of stacks to acquire. These parameters should remain consistent throughout the study. NOTE: We recommend imaging 8 to 10 stacks of 1 µm thickness. Stay consistent in the number of stacks imaged throughout the study. Image tissue sections stained with primary antibodies and IgG control for all channels including DIC. Label at least one image with a scale bar for image calibration during single cell counting. Install and open ImageJ. If necessary, download Plugins in the section Download > Input/Output of the ImageJ website to open the image file generated depending of the format of the images generated by the confocal microscope. Open the image file in ImageJ. Calibrate the image with a reference scale bar using the image generated in 6.6. Delineate the region of interest in which single cell counting will be performed using the DIC channel (Figure 4). NOTE: One region can be delineated at a time. Depending of the experimental questions, single cell counting can be performed in the entire lesion area (see 7.3.1) and/or in a sublocation of the lesion. For example, investigation of the fibrous cap area (see 7.3.2) is particularly relevant since its cellular composition is an important index of lesion propensity to rupture. Delineate the lesion area by following the lumen border (Figure 4A; white arrows) and the internal elastic lamina (Figure 4A; yellow arrows) visible on the DIC image. For analysis of the fibrous cap area, determine the border distant of 30 µm from the lumen and trace the border ( Figure 4B-D). NOTE: The fibrous cap area is classically defined as the region enriched in ACTA2+ cells and collagen underlaying the lumen (Figure 4B). 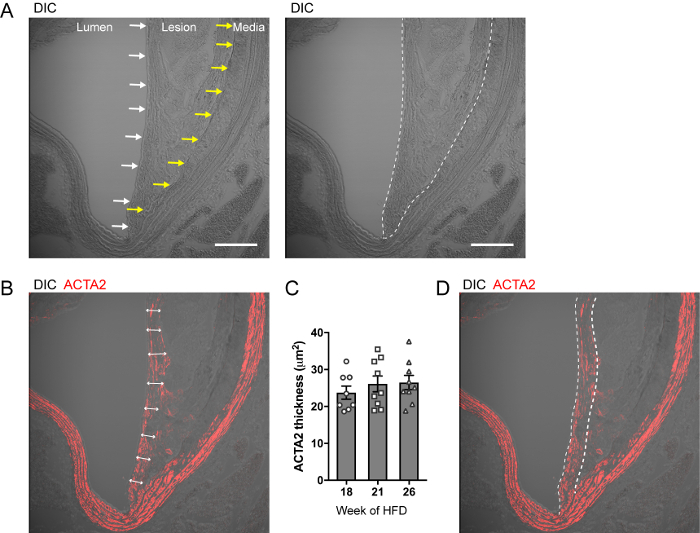 The enrichment in ACTA2+ cell and collagen plays a critical role in lesion stability. Previous studies have determined that the ACTA2+ cell rich fibrous cap area averages a thickness of 30 µm from the lumen in SMC-lineage tracing ApoE-/- mice fed a high-fat diet for 18 to 26 weeks (Figure 4C). Thus, meticulous characterization of the effects of genetic manipulation or pharmacological treatment on the fibrous cap area cellular composition is remarkably relevant. Open the Channels Tools panel (Image > Color > Channel Tools) and pseudo-color the different staining channels (Figure 5A; box 1). Merge the color channels (Image > Color > Merge Colors) (Figure 5A; box 2). All channels should be visible on the same image (Figure 5B). Turn on and off individual color channels using the Channel Tools panel (Figure 5A; box 1). Set up the counting tool. Right click on the Counting icon in the tool bar (Figure 5C; box 1) and select Multi-Point Tool. Double click on the same icon to open the Point Tool panel (Figure 5C; box 2). Select the type and size of the items used to count cells. Turn on the DAPI channel only in the Channel Tools panel and select the Counter channel 0 (Figure 5C; box 3). Click on individual nuclei that will be tagged (e.g., yellow dots in Figure 5C-D). Scroll z-stacks to count all nuclei stained in the region of interest. The number of events is indicated below the counter channel in Point Tool panel (Figure 5C; box 4). Turn on another staining channel (e.g., eYFP staining). Select the Counter channel 1. Click cells in which there is a colocalization between DAPI and staining. For cytoplasmic staining, select cells for with staining surrounds the nucleus on the entire depth of the nucleus (check several z-stacks). Repeat by modifying the staining combinations and selecting new Counter channels to count the cell populations of interest. Every dot color represents a different cell population (Figure 5D). Results can be expressed as number of cells to total number of DAPI or number of cells to region area. 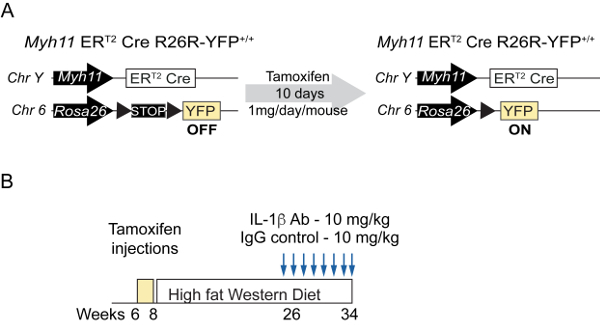 Myh11-Cre/ERT2 R26R-EYFP Apoe-/- mice were injected with tamoxifen between six and eight weeks of age before being fed a high fat diet. At 18 weeks of high fat diet feeding, two groups of eight mice were treated weekly with either a mouse monoclonal anti-IL-1β antibody or an isotype-matched IgG control at 10 mg/kg for 8 weeks (Figure 1)7. Mice were sacrificed and perfused with a 4% PFA-PBS solution. Brachiocephalic arteries were dissected, processed, and sectioned as described above (Figure 2 and Figure 3). After immunofluorescent staining with antibodies targeting the lineage tracing reporter (YFP) and phenotypic markers (ACTA2, LGALS3, RUNX2), a thickness of 8-10 µm of the BCA cross sections was imaged using a confocal microscope. Images of each individual staining, DAPI (nuclear staining), and DIC were acquired. Delineation of regions of interest for single cell counting (lesion, fibrous cap) was performed using DIC images (Figure 4). Single cell counting to determine the abundance of different SMC-derived populations was performed using ImageJ (Figure 5). We present two representative immunofluorescent staining and single counting assessing the effect of IL-1β inhibition on cellular composition in advanced atherosclerotic lesions. First, staining was done for the SMC lineage tracing reporter YFP, the SMC marker ACTA2, and the macrophage marker LGALS3 in cross sections at two different locations of the BCA (480 µm and 780 µm from the aortic arch) (Figure 6). Single cell counting analysis in the fibrous cap region of these cross section were performed, and remarkable differences were found in the cellular composition of the fibrous cap area between mice treated with the anti-IL-1β antibody and mice treated with the isotype-matched IgG control (Figure 6A). 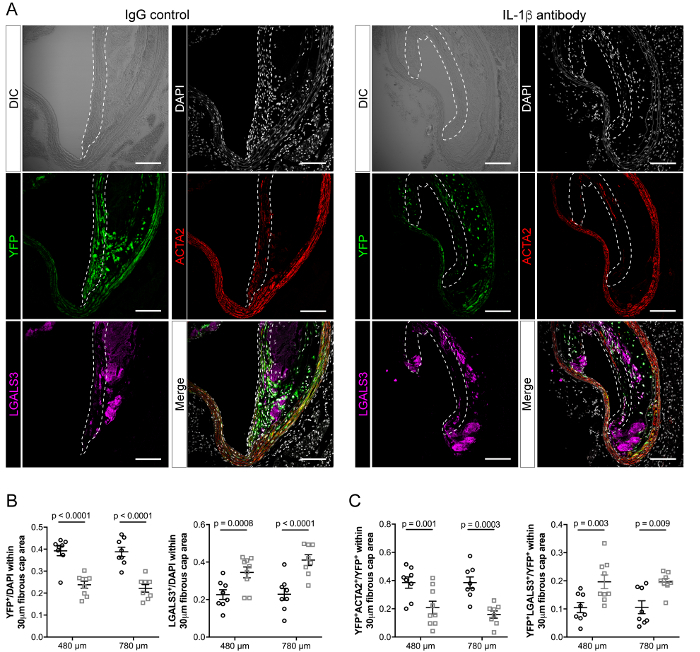 Inhibition of IL-1β was associated with a decrease in YFP+ SMC and an increase in LGALS3+ cells (Figure 6B). Regarding the phenotypes of SMC populations, a decrease in the number of YFP+ACTA2+ SMC was observed, whereas the relative number of SMC-derived macrophages (YFP+LGALS3+) was significantly increased at both BCA locations (Figure 6C). Finally, we investigated the effect of IL-1β inhibition on the SMC phenotypic transition into chondrogenic cells. This phenotypic transition is an important driver of vascular calcification, major feature of late-stage atherosclerosis14,32,33. BCA cross-sections were stained for the SMC lineage tracing reporter YFP, the osteochondrogenic marker RUNX2, and the macrophage marker LGALS3 (Figure 7A). The abundance and the origin of the RUNX2+ chondrogenic cells were characterized within the lesion area in our two experimental groups. We found that inhibition of IL-1β did not impact the overall number of RUNX2+ cells within the lesion, nor the proportion of SMC-derived (YFP+RUNX2+) and macrophage-derived (YFP-LGALS3+RUNX2+) chondrogenic cells (Figure 7B). Figure 1: Intervention studies in Smooth Muscle cell lineage tracing mice. (A) Schematic representation of the Myh11-Cre/ERT2 R26R-EYFP Apoe-/- tamoxifen-inducible SMC specific lineage tracing mouse model. Treatment with tamoxifen induces recombination of the R26R-YFP locus and the excision of a STOP codon and the permanent expression of YFP by SMC. (B) Schematic of intervention studies in which Myh11-Cre/ERT2 R26R-EYFP Apoe-/- mice fed a Western diet for 18 weeks were injected weekly with the IL-1β antibody or an isotype-matched IgG control antibody at a concentration of 10 mg/kg for 8 weeks. Please click here to view a larger version of this figure. Figure 2: Brachiocephalic artery dissection. (A) Schematic of a gravity driven perfusion system. The system is set up at a precise height allowing perfusion at a pressure close to the average systolic blood pressure in mice. The pressure slightly varies with volume height as liquid is used during perfusion between height h1 and h2. (B) Equation for calculation of the pressure of static fluids and determination of the height to reach a pressure of perfusion equal to the C57Bl6 mouse average systolic blood pressure. (C) Pictures of the proximal aorta and branching arteries in C57Bl6 mouse fed a chow diet (left picture) and Apoe-/- mouse fed a high fat diet for 26 weeks (right picture). The asterisk indicates the presence of atherosclerotic lesions. (D) Schematic of the proximal aorta and branching arteries. Red arrows represent cuts for isolation of the right carotid and brachiocephalic artery isolation and numbers indicate the order of the cuts. Please click here to view a larger version of this figure. Figure 3: Tissue processing, embedding, and sectioning. (A) Photograph of an embedding cassette with BCA tissue. The BCA is positioned on a foam pad. (B) Zoom-in of the BCA positioned on the foam pad. The BCA is oriented with the aortic arch close to the label part of the cassette and the carotid straightened vertically. Scale bar: 1 cm. (C) Schematic of paraffin block after embedding of the brachiocephalic artery. (D) Schematic of serial slides with 10 µm-thick serial sections with indication of the distance from the aortic arch. Please click here to view a larger version of this figure. Figure 4: Delineation of the atherosclerotic lesion and fibrous cap area. (A) Representative micrographs of DIC image atherosclerotic lesion in brachiocephalic artery cross-sections from Myh11-Cre/ERT2 R26R-EYFP Apoe-/-. The luminal and the internal elastic lamina borders are localized by white and yellow arrows, respectively (left panel). The lesion area is delineated by a dashed line (right panel) Scale bar: 100 µm. (B) Representative micrographs of DIC and ACTA2 staining. Double-head arrows show the thickness of the ACTA2 staining within the area underlaying the lumen defining the fibrous cap area. (C) Quantification of the subluminal ACTA2+ thickness in Myh11-Cre/ERT2 R26R-EYFP Apoe-/- fed a high-fat diet for 18, 21 and 26 weeks. Using this strain of mice, the fibrous cap has an average thickness of 25-30 µm in advance atherosclerotic lesions. Results are expressed as mean ± SEM. (D) Delineation of a fixed 30 µm thick fibrous cap area for single cell counting. Please click here to view a larger version of this figure. Figure 5: Single cell counting using ImageJ. 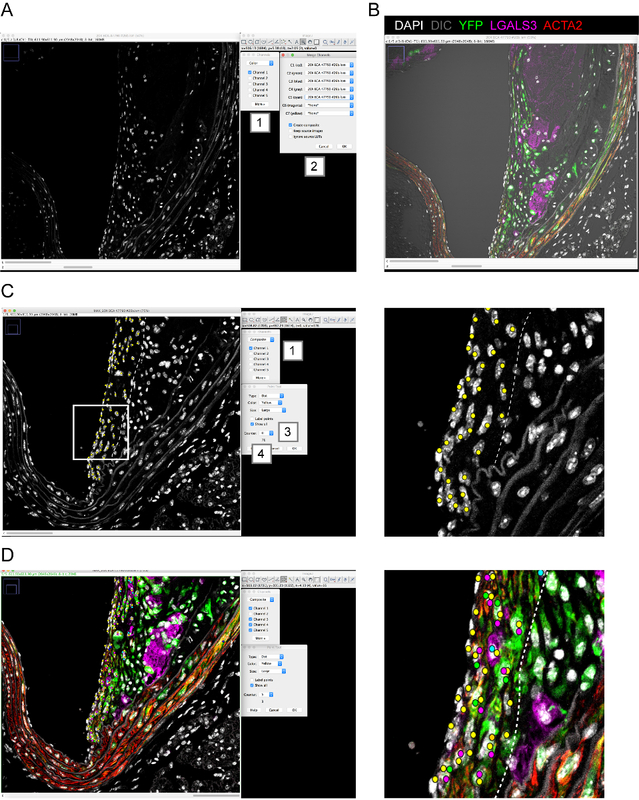 Screen captures illustrating key steps of single cell counting with ImageJ on images acquired by confocal microscopy. (A) Each individual staining channel and individual z-stack are visible by scrolling c: and z: bars at the bottom of the image. Staining channels are pseudo-colored using the Channel panel (1) Staining channels (YFP, LGALS3, ACTA2, DAPI for nuclear staining and DIC) are merged using the Merge Channel panel (2). (B) Results of channel merging for YFP, LGALS3, ACTA2, DAPI, and DIC. (C) Nucleus counting based on DAPI staining using the Counting icon (1) and Point Tool panel (2). A different counter channel is used for each cell population (3). The number of events counted is indicated below the counter channel (4). White rectangle: region enlarged on the right. (D) Representative image of single cell counting within the fibrous cap area (dashed line) for multiple cell populations including DAPI (yellow dots), YFP+ cells (magenta dots), YFP-LGALS3+ cells (cyan dots), YFP+LGALS3+ cells (orange dots), YFP+ACTA2+ cells (green dots), and YFP-ACTA2+ cells (dark blue dots). White rectangle: region enlarged on the right. Please click here to view a larger version of this figure. Figure 6: Characterization of the effects of IL-1β inhibition on the cellular composition of the fibrous cap area at two distinct BCA locations of SMC lineage tracing Apoe-/- mice. (A) BCA cross sections at 480 µm and 780 µm from the aortic arch from mice treated with the IL-1β antibody or the IgG control as shown in Figure 1 were stained for YFP, LGALS3, and DAPI (nuclear staining) and the section was imaged by DIC. Immunofluorescent channels were merged (bottom right panels). The dashed lines delineate the fibrous cap regions. Scale bars: 100 µm. (B) Single cell counting reveals that inhibition of IL-1β is associated with a significant decrease in YFP+ cells and an increase in LGALS3+ cells within the fibrous cap area. C) Within the YFP+ cell population, a decrease in YFP+ACTA2+ and an increase in YFP+LGALS3+ populations are observed. Results are expressed as mean ± SEM. Statistical analysis: unpaired multiple t-test. Please click here to view a larger version of this figure. Figure 7: Effect of IL-1β inhibition on the number of RUNX2+ chondrogenic cells with advanced atherosclerotic lesions. A) BCA cross sections are stained for YFP, LGALS3, RUNX2 and DAPI (nuclear staining), and all channels were merged (bottom panels). The dashed lines delineate the lesion area. Scale bars: 100 µm. B) Single cell counting shows that inhibition of IL-1β does not impact the total number of RUNX2+ cells within the lesion nor the proportion of RUNX2+ cells from SMC origin (YFP+RUNX2+; YFP+LGALS3+RUNX2+) and myeloid origin (YFP-LGALS3+RUNX2+). Results are expressed as mean SEM. Statistical analysis: Unpaired multiple t-test. Please click here to view a larger version of this figure. Despite decades of research and technical advances in studying atherosclerosis, the field has a disappointing history of translating scientific findings to clinical therapies34,35. This phenomenon may be explained in part by discrepancies in animal models, experimental designs, and lesion analyses. Herein, we describe an experimental pipeline that we used to analyze the cellular composition in advanced atherosclerotic lesions using lineage tracing mice7. This method allows for a meticulous investigation of cell fate mapping and phenotyping, which are key parameters controlled by potential mechanisms at play in advanced atherosclerotic lesions. The SMC-lineage tracing mouse model is a powerful tool to accurately track the fate and phenotypic modulations of this lineage and their contribution to atherosclerosis pathogenesis. The tamoxifen-inducible Cre-loxP system enables labeling of mature vascular SMC expressing MYH11 prior to the initiation of atherosclerosis. Compelling evidence using this system has demonstrated that atherosclerotic plaques are highly plastic and vascular SMC can undergo phenotypic switching, losing their contractile phenotype and SMC-specific markers, proliferating, migrating, and even transdifferentiating into macrophage-like cells17,18. In the present protocol, we show how lineage-tracing detection and immunofluorescent staining for markers of interest can be integrated to precisely determine phenotypic transitions undertaken by SMC and their relative frequency among other SMC populations. This methodology is highly complementary with other assays frequently performed in the field. First, assessment of atherosclerotic lesion burden by en face aortic preparations combined with lipid staining by Sudan IV is widely used due to its convenience and speed. However, this is an inadequate measure of key morphological parameters such as lesion size, lumen size, and vessel remodeling. Staining of en face aortic preparation by Sudan IV to visualize lipid deposition can be used to quantify relative lesion area within the aorta, but it can provide inconsistent staining of lesions, as only the neutral lipid component is visualized while regions occupied by other constituents, such as extracellular matrix, usually are neglected8. Moreover, en face staining is unable to inform about the lesion morphology and cannot distinguish between fatty streaks and advanced lesions. Vessel morphology is an important parameter used for evaluating atherosclerosis stage and rupture risk, including lesion size, lumen diameter, vessel remodeling7,36,37. These analyses require the conservation of the vessel morphology for proper quantification. Importantly, protocols for investigation of morphological parameters greatly overlap with the protocol detailed here. In particular, they rely on the use of a gravity-driven vascular perfusion system for PBS and fixative perfusion to provide greater consistency in the pressure applied. The gravity-driven infiltration system guarantees a constant flow speed and pressure between each independent mouse and prevents the inconsistency of manual force-driven perfusion between independent experiments or researchers. The gravity perfusion system should be set up to induce perfusion at a pressure near the average murine blood pressure (70-120 mmHg). Second, we provided a standardized and systematic method of embedding and sectioning for the brachiocephalic artery. By defining the start site of sectioning and quantifying the lesion area at multiple locations throughout the brachiocephalic artery, we can limit the random variation that comes with limited sampling. Flow cytometry is another technique highly complementary with immunofluorescent staining coupled with single cell counting that has been widely used in quantifying cell populations within atherosclerotic lesions38. It consists of the digestion of mouse aorta and labeling of the released cells with fluorescent antibodies. 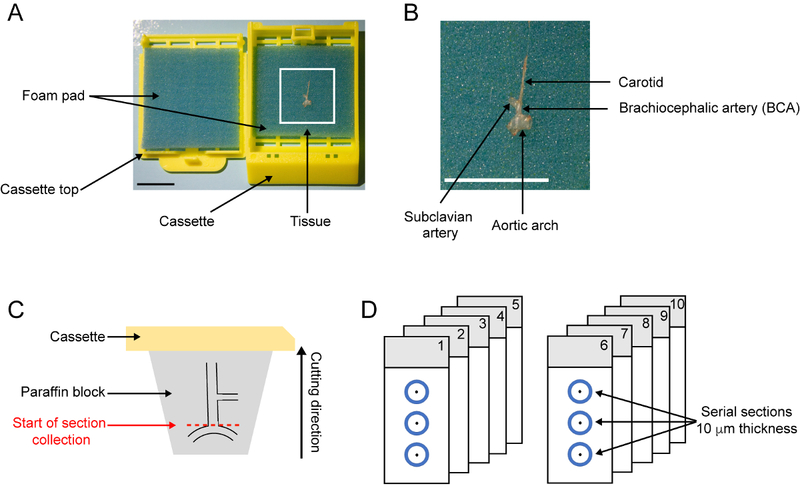 Flow cytometry offers a quantitative analysis of the cellular populations present in the aorta. However, like all technologies, flow cytometry has limitations. Despite the distinct benefit of fitting a large array of simultaneous markers, there is a complete loss of spatial resolution, and it becomes unclear whether a cell population is enriched in the fibrous cap or the necrotic core. Additionally, there is a risk of dilution effect since flow cytometry requires a large number of cells and often does not focus only on atherosclerotic areas. For this reason, immunofluorescence and flow cytometry can be used in a complementary manner to allow for both high dimensional profiling and lesion localization. Finally, the protocol is focused on the quantification of SMC populations in BCA advanced lesion using paraformaldehyde-fixed and paraffin-embedded tissue sections. However, this protocol can be used to investigate other vascular beds including the aortic root or the abdominal aorta, two vascular territories subject to atherosclerosis development. Systematic processing and sectioning of the aortic root have been previously well described8,39. As atherosclerosis develops at different locations and that genetic manipulation or therapeutic intervention can non-homogenously impact these sites21, it is important to investigate as many vascular beds as possible to draw accurate conclusions. Immunofluorescent staining and single cell counting can also be performed using frozen sections. This might be necessary due to the incompatibility of antibodies with paraffin sections. Although the animal perfusion and tissue embedding will differ from this protocol, investigators can follow the rest of the experimental procedures described here. In conclusion, the techniques described here outline a systematic approach to analyzing lesion cell populations and phenotypes in late-stage murine atherosclerosis. This protocol can serve as a template to investigate lesion populations by immunofluorescent staining in all types of experimental design including early and late-stage atherosclerosis, as well as prevention and intervention studies. We thank the Center for Biologic Imaging (supported by NIH 1S10OD019973-01) at the University of Pittsburgh for their assistance. This work was supported by is supported by Scientific Development Grant 15SDG25860021 from the American Heart Association to D.G. R.A.B. was supported by NIH grant F30 HL136188. GBD DALYs and HALE Collaborators. Global, regional, and national disability-adjusted life-years (DALYs) for 315 diseases and injuries and healthy life expectancy (HALE), 1990-2015: a systematic analysis for the Global Burden of Disease Study 2015. Lancet. 388, (10053), 1603-1658 (2016). Benjamin, E. J., et al. Heart Disease and Stroke Statistics-2018 Update: A Report From the American Heart Association. Circulation. 137, (12), 67-92 (2018). Hay, M., Thomas, D. W., Craighead, J. L., Economides, C., Rosenthal, J. Clinical development success rates for investigational drugs. Nature Biotechnology. 32, (1), 40-51 (2014). Bhaskar, V., et al. Monoclonal antibodies targeting IL-1 beta reduce biomarkers of atherosclerosis in vitro and inhibit atherosclerotic plaque formation in Apolipoprotein E-deficient mice. Atherosclerosis. 216, (2), 313-320 (2011). Isoda, K., et al. Lack of interleukin-1 receptor antagonist modulates plaque composition in apolipoprotein E-deficient mice. Arteriosclerosis, Thrombosis, and Vascular Biology. 24, (6), 1068-1073 (2004). Kirii, H., et al. Lack of interleukin-1beta decreases the severity of atherosclerosis in ApoE-deficient mice. Arteriosclerosis, Thrombosis, and Vascular Biology. 23, (4), 656-660 (2003). Gomez, D., et al. Interleukin-1β has atheroprotective effects in advanced atherosclerotic lesions of mice. Nature Medicine. 24, 1418-1429 (2018). Daugherty, A., et al. Recommendation on Design, Execution, and Reporting of Animal Atherosclerosis Studies: A Scientific Statement From the American Heart Association. Circulation Research. 121, (6), 53-79 (2017). Baylis, R. A., Gomez, D., Owens, G. K. Shifting the Focus of Preclinical, Murine Atherosclerosis Studies From Prevention to Late-Stage Intervention. Circulation Research. 120, (5), 775-777 (2017). Kolodgie, F. D., et al. Pathologic assessment of the vulnerable human coronary plaque. Heart. 90, (12), 1385-1391 (2004). Virmani, R., Kolodgie, F. D., Burke, A. P., Farb, A., Schwartz, S. M. Lessons from sudden coronary death: a comprehensive morphological classification scheme for atherosclerotic lesions. Arteriosclerosis, Thrombosis, and Vascular Biology. 20, (5), 1262-1275 (2000). Gomez, D., Owens, G. K. Smooth muscle cell phenotypic switching in atherosclerosis. Cardiovascular Research. 95, (2), 156-164 (2012). Speer, M. Y., et al. 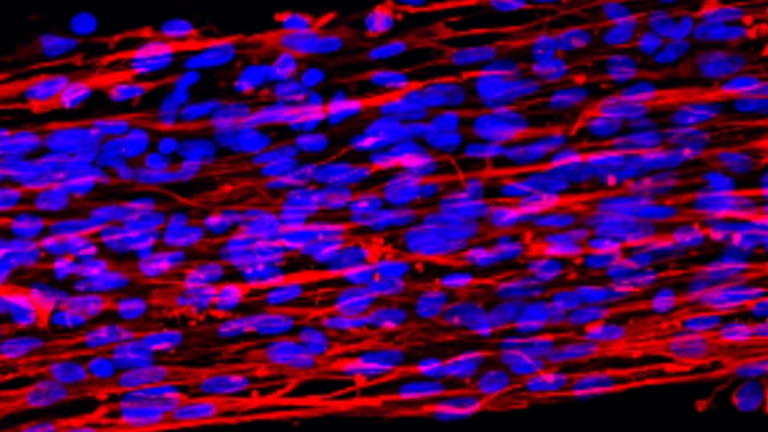 Smooth muscle cells give rise to osteochondrogenic precursors and chondrocytes in calcifying arteries. Circulation Research. 104, (6), 733-741 (2009). Gomez, D., Shankman, L. S., Nguyen, A. T., Owens, G. K. Detection of histone modifications at specific gene loci in single cells in histological sections. Nature Methods. 10, (2), 171-177 (2013). Feil, S., et al. Transdifferentiation of vascular smooth muscle cells to macrophage-like cells during atherogenesis. Circulation Research. 115, (7), 662-667 (2014). Shankman, L. S., et al. KLF4-dependent phenotypic modulation of smooth muscle cells has a key role in atherosclerotic plaque pathogenesis. Nature Medicine. 21, 628 (2015). Cherepanova, O. A., et al. Activation of the pluripotency factor OCT4 in smooth muscle cells is atheroprotective. Nature Medicine. 22, 657 (2016). Albarran-Juarez, J., Kaur, H., Grimm, M., Offermanns, S., Wettschureck, N. Lineage tracing of cells involved in atherosclerosis. Atherosclerosis. 251, 445-453 (2016). Chappell, J., et al. Extensive Proliferation of a Subset of Differentiated, yet Plastic, Medial Vascular Smooth Muscle Cells Contributes to Neointimal Formation in Mouse Injury and Atherosclerosis Models. Circulation Research. 119, (12), 1313-1323 (2016). Newman, A. A., et al. Irradiation abolishes smooth muscle investment into vascular lesions in specific vascular beds. JCI Insight. 3, (15), (2018). Dobnikar, L., et al. Disease-relevant transcriptional signatures identified in individual smooth muscle cells from healthy mouse vessels. Nature Communications. 9, (1), 4567 (2018). Misra, A., et al. Integrin beta3 regulates clonality and fate of smooth muscle-derived atherosclerotic plaque cells. Nature Communications. 9, (1), 2073 (2018). Majesky, M. W., et al. Differentiated Smooth Muscle Cells Generate a Subpopulation of Resident Vascular Progenitor Cells in the Adventitia Regulated by Klf4. Circulation Research. 120, (2), 296-311 (2017). Herring, B. P., Hoggatt, A. M., Burlak, C., Offermanns, S. Previously differentiated medial vascular smooth muscle cells contribute to neointima formation following vascular injury. Vascular Cell. 6, 21 (2014). Sheikh, A. Q., Misra, A., Rosas, I. O., Adams, R. H., Greif, D. M. Smooth muscle cell progenitors are primed to muscularize in pulmonary hypertension. Science Translational Medicine. 7, (308), (2015). Bentzon, J. F., Majesky, M. W. Lineage tracking of origin and fate of smooth muscle cells in atherosclerosis. Cardiovascular Research. 114, (4), 492-500 (2018). Wirth, A., et al. G12-G13-LARG-mediated signaling in vascular smooth muscle is required for salt-induced hypertension. Nature Medicine. 14, (1), 64-68 (2008). Mattson, D. L. Comparison of arterial blood pressure in different strains of mice. American Journal of Hypertension. 14, (5), Pt 1 405-408 (2001). Whitesall, S. E., Hoff, J. B., Vollmer, A. P., D'Alecy, L. G. Comparison of simultaneous measurement of mouse systolic arterial blood pressure by radiotelemetry and tail-cuff methods. American Journal of Physiology-Heart and Circulatory Physiology. 286, (6), 2408-2415 (2004). Durgin, B. G., et al. Smooth muscle cell-specific deletion of Col15a1 unexpectedly leads to impaired development of advanced atherosclerotic lesions. American Journal of Physiology-Heart and Circulatory Physiology. 312, (5), 943-958 (2017). Durham, A. L., Speer, M. Y., Scatena, M., Giachelli, C. M., Shanahan, C. M. Role of smooth muscle cells in vascular calcification: implications in atherosclerosis and arterial stiffness. Cardiovascular Research. 114, (4), 590-600 (2018). Lin, M. E., et al. Runx2 Deletion in Smooth muscle Cells Inhibits Vascular Osteochondrogenesis and Calcification but not Atherosclerotic Lesion Formation. Cardiovascular Research. (2016). Kilkenny, C., Browne, W. J., Cuthill, I. C., Emerson, M., Altman, D. G. Improving Bioscience Research Reporting: The ARRIVE Guidelines for Reporting Animal Research. PLoS Biology. 8, (6), 1000412 (2010). Landis, S. C., et al. A call for transparent reporting to optimize the predictive value of preclinical research. Nature. 490, (7419), 187-191 (2012). Nishioka, T., et al. Contribution of inadequate compensatory enlargement to development of human coronary artery stenosis: An in vivo intravascular ultrasound study. Journal of the American College of Cardiology. 27, (7), 1571-1576 (1996). Pasterkamp, G., et al. Paradoxical Arterial-Wall Shrinkage May Contribute to Luminal Narrowing of Human Atherosclerotic Femoral Arteries. Circulation. 91, (5), 1444-1449 (1995). Galkina, E., et al. Lymphocyte recruitment into the aortic wall before and during development of atherosclerosis is partially L-selectin dependent. The Journal of Experimental Medicine. 203, (5), 1273-1282 (2006). Venegas-Pino, D. E., Banko, N., Khan, M. I., Shi, Y., Werstuck, G. H. Quantitative analysis and characterization of atherosclerotic lesions in the murine aortic sinus. Journal of Visual Experiments. (82), 50933 (2013).